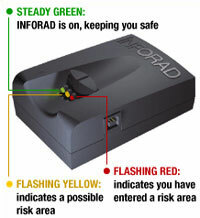 Inforad Warns Of Speedtraps | OhGizmo! By David Ponce on 06/14/06 • Leave a comment! If you live in Europe, Inforad just came up with a fairly cheap way to keep you from getting tickets. This handy device comes with a GPS module inside, so it always knows where it is. It also contaiins a regularly updated database of over 11,00 known speedtraps. As you’re about to come within striking distance of a speed camera, it alerts you. Of course, this road legal system is not perfect. It won’t know if an actual live cop is hiding behind a bush or something, but it still helps. The first year’s worth of updates is free, with subsequent ones costing ?24.99 while a lifetime subscription is just ?49.99. The device itself will ding your wallet for ?80.